LAKEWOOD, Pa. — In the woods here on Tuesday, campers stood in a line holding quails, feeling their warm bodies and beating hearts in their hands. “Guys, do not bond with your birds,” Hillie Ackerman, 16, a camper from Brooklyn, warned his friends. The birds were about to be slaughtered. One by one, the boys handed the quails to a shochet, a Jewish slaughterer, who took a knife, its sharpness tested earlier against his own fingernail, and sliced the birds’ necks. For a second, each quail shuddered, then went limp. The slaughterer tossed it into a plastic tub that quickly become splattered with blood. 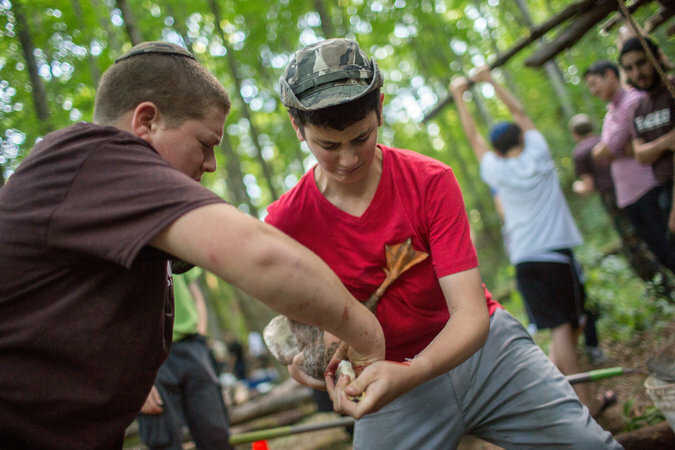 By the time darkness descended, the campers here at Yagilu Wilderness, an Orthodox Jewish summer camp for boys in the Poconos, in northeast Pennsylvania, had collected the carcasses of more than 120 freshly killed quails, partridges and ducks. The campers were learning the tradition of a kosher slaughter and preparing the birds for fund-raisers to benefit the Masbia Soup Kitchen Network, a group of kosher soup kitchens about 160 miles away in New York City that serve over two million meals a year. “Judaism is a lot about food, and the tradition around food,” said Alexander Rapaport, a founder of Masbia, who organized the slaughter. 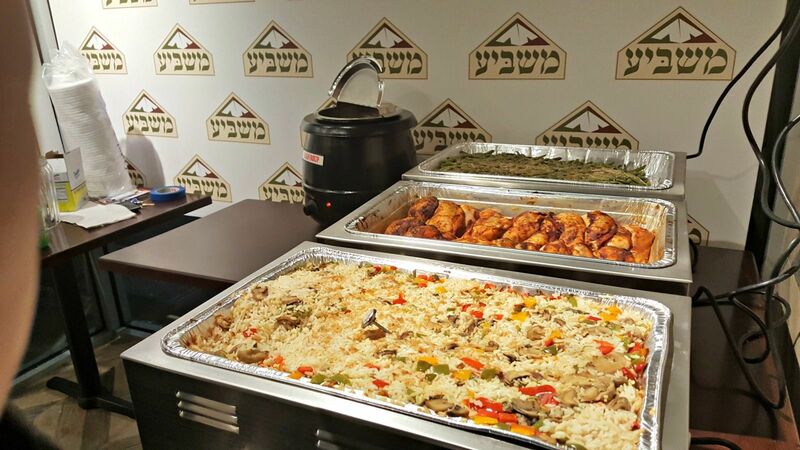 Earlier that morning Mr. Rapaport had traveled from New York with the slaughterer, Bentzion Zieda, and Rabbi Chaim Loike, the rabbinical coordinator for the Orthodox Union, an organization that oversees kosher food certification. Along the way, they stopped at markets and farms to buy the birds. An assembly line of sorts formed at the camp: a clearing in the woods to cut the throats, tables covered in plastic to defeather and gut the birds, a rinsing station, a soaking station and crates to hold the meat while blood was drawn out. He showed the campers what to look for to ensure a kosher slaughter. The animal should not have any defects or signs of illness. One misstep in the process, such as a nick in the knife, means the slaughter was not kosher. Ideally the trachea and the esophagus should be cleanly cut, he said, pulling back the partially severed head of a quail to demonstrate. Gilad Lipsky, 15, a camper from Beit Shemesh, Israel, shook his head and stood back from the table. “I don’t know,” he said. Discarded feathers, organs, feet and heads piled up as the campers worked. The boys saved the livers to grill later for a snack. “It’s not that bad once you get used to it,” Aaron Stein, 16, from Lower Merion, Pa., said as he peeled the skin and feathers off a quail with his bare hands. Rabbi Tani Prero, the director of Yagilu, had spent several weeks preparing the group of about 40 teenage campers for the slaughter. Among many other rules, a kosher slaughter must not violate five proscribed practices: pausing during the slaughter, tearing the trachea or the esophagus, burying the knife blade in the skin, cutting the trachea or the esophagus in the wrong location or using unnecessary pressure. Tuvia Goldstein, 17, from Chicago, said he was a little nervous before the slaughter began. But as it proceeded, he started to relax. “It’s bloody, but it’s organized and they know what they are doing,” Tuvia said. When the ground became spotted with blood, a camper would cover it with dirt and say a blessing in Hebrew. Tuvia and another camper, Chaim Horowitz, 18, from Baltimore, explained that certain passages in the Torah dictate whether birds are kosher. Birds of prey like hawks, for example, are forbidden. With daylight waning and appetites ravenous after hours of disemboweling birds, the group gathered to say daily prayers. Afterward, all but a handful of campers rushed off to dinner, telling one another to wash the blood and guts off their hands. 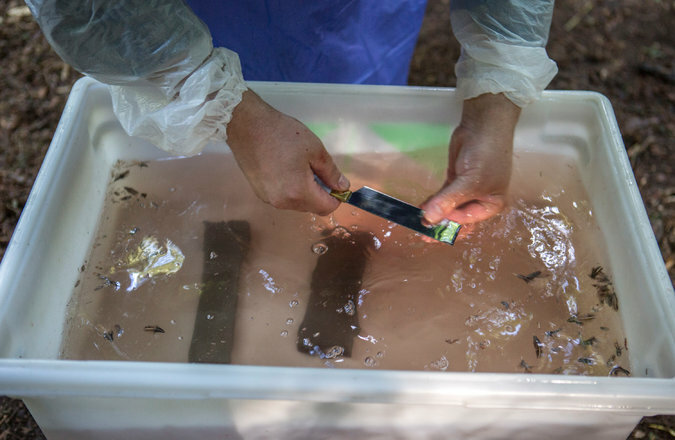 Reuven Prero, 16, a camper from Baltimore and a cousin of Rabbi Prero, volunteered to stay and finish cleaning the remaining ducks — the most difficult of the birds that had been slaughtered because of their size, their plumage and the fact that their skin is left intact. “This is what’s in your pillows,” Reuven said, stroking the down of a limp duck in his hands.